Metal post with attached metal plate by the A444, in parish of OVERSEAL (SOUTH DERBYSHIRE District), Burton Road, by No. 6, in pavement, back to ornate brick retaining wall, on East side of road. 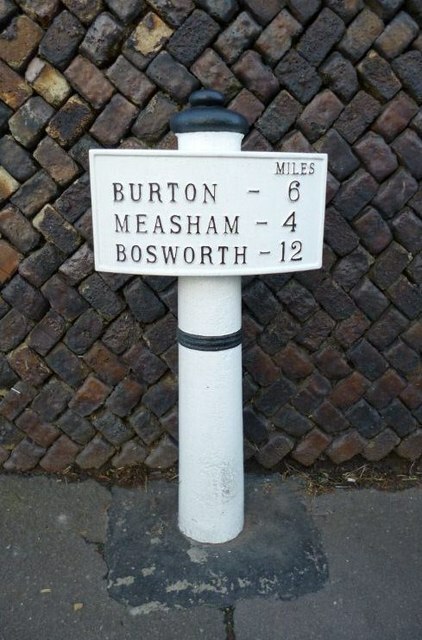 Measham iron post Erected by the Burton on Trent to Market Bosworth turnpike trust in the 19th century. Inscription reads:- : MILES / BURTON - 6 / MEASHAM - 4 / BOSWORTH - 12 / : : : . ; . Milestone Society National ID: DE_BTBW06. © Copyright J Scrine and licensed for reuse under this Creative Commons Licence.